File image of women and child development minister Maneka Gandhi. 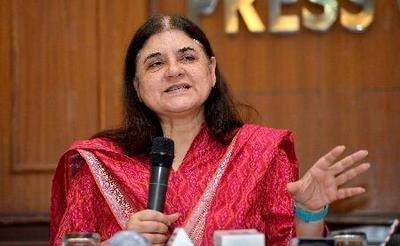 The Women and Child Development Minister Maneka Gandhi said on Thursday that a recent State-level inquiry has revealed the presence of 14 lakh “fake children” in Assam’s beneficiary list of Anganwadis. She said following this finding the Centre asked all States to similarly weed out non-existing beneficiaries from the list of the country’s total 10 crore beneficiaries. A report published in the The Indian Express stated that the minister made this revelation while addressing a conference on Rashtriya Poshan Maah (National Nutrition Month). Under the supplementary nutrition scheme of the Integrated Child Development Services, 14 lakh Anganwadis provide home rations to a total of 4.6 crore infants and 1.9 crore mothers and hot cooked meals to 3.6 crore children aged between 3 and 6. The report further quoted the minister as saying, “Thanks to Assam we found out how many children are really being fed in Anganwadis. In the initial survey last year, it was found that there are 3 lakh fake children. Now again, another survey in June 2018 has revealed that there are actually 14 lakh fake children.” She said ground level workers “inflated the beneficiary lists leading to pilferage and leakage in funds”. Women and Child Development (WCD) Secretary Rakesh Shrivastava clarified that the fake beneficiary list had nothing to do with the National Register of Citizens (NRC) in Assam. “Since Assam has shown the way, other States too should ensure they carry out a physical verification,” he said. Ministry officials said that 12 ministries will coordinate for the nutrition month focusing on issues such as antenatal care, anaemia, sanitation, food fortification, complementary feeding, breastfeeding, growth monitoring, and focus on girl’s diet and age of marriage.